It also brought to mind a summer or two spent in Prince Edward Island. 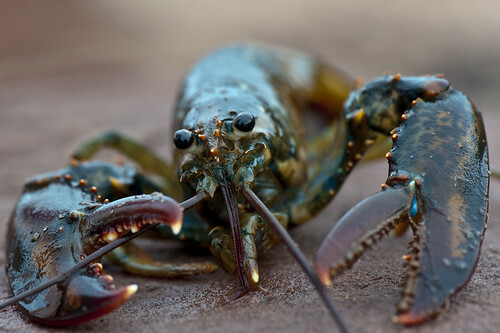 Unlike many who fall in love with PEI, my memories are of very fat tourists, waiting in very long lines for very mediocre and over priced lobster dinners. No kid wants to spend their holiday in a hot car, so that's my plea to parents this year. Make more of your vacation about enjoying a place rather than getting there. For some reason, our parents have a highly delusional Pollyannaish view of summer vacations and road trips. To this day I avoid long drives to the chagrin of those around me. It's hot and it is incredibly dull and when you are a kid and only four feet tall, you sit in the back of a car and all you see is the inside of a car door. Dullsville. So Parents, have some empathy and don't project your memories or pleasures onto your kids. Sitting in the front of a car is only slightly better than the back but don't kid yourself that your children are sitting back there for five hours having a hoot. Their best recollection of summer may be the Dora the Explorer DVD they watched 20 times while you argued about getting off or staying on the Interstate. There's no greater reminder that you're in the heart of summer in the city than the arrival of Caribana. Apparently, Caribana goes back to the slave days, when slaves received just one day off in the entire year. In that one day, I guess they partied like it was, well, their only day of freedom. Despite the music, the dancing, the food and the general bonhomie, I'm a West end resident who innately hates crowds, so I may flee to the East end of town or out of town altogether. Either way, come Friday I'm fleeing my desk for a nice midsummer break. This coming long weekend (Simcoe Day for those in Ontario) affords me the chance to take a 9 day holiday while only taking 4 days from my paid leave. That's some sweet math right there. 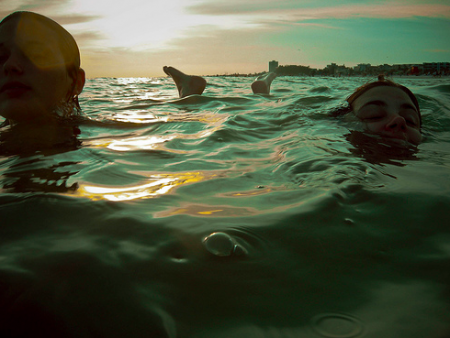 What would summer be without a little time to do absolutely nothing. Apparently, Toronto is currently under threat of a Severe Thunderstorm. Yet it is so sunny, hot and surprisingly free of humidity that it's hard to believe. If there is going to be a thunderstorm it will have to happen out of the blue (skies). I was going to write about how fantastic it was that on Sunday, with little planning or preparation I did what I call a "Tin Man" or mini triathlon. After talking to Mike I realized it's a real event called the Sprint Triathlon. I had started the morning doing some yard work, moving a few 18 kg bags of stones around and looked at my watch and saw that if I'd wanted to swim, I'd better get a move on. So I packed my swim gear on the bike and thought I should just put on my bike shoes and go for little ride afterwards. I got to the pool and did 40 laps in about 20 minutes. I then left the pool and jumped on my bike and rode 20km. To be honest it was a relatively cool day with good cloud cover and there was so much traffic it was hard to actually get any speed up, so the ride was over at a leisurely 56 minutes. On the way back to the house I thought how good I felt and that I could probably run another 5 km. When I got home, I changed my shoes and was feeling as fresh as a daisy and twice as fragrant. This is great, I thought. I don't even need to stretch. After the first few strides, I almost fell over. My legs had suddenly and without warning turned to noodles. For some reason, I didn't stop and all I could think was that I had started this, so I was going to finish it. My time for 5km? A pretty weak 34 minutes. When I got home I thought I was going to puke. But I didn't, so I changed and went back out to finish the yard work I'd started earlier. I have to be honest. I felt pretty macho. I felt like there was nothing I couldn't spit at and not destroy. Nothing I could say that would be wrong. Then I read Jens Voigt's account of crashing and finishing stage 16 of the Tour de France with seven stitches in his elbow, acreage of road rash and a few cracked ribs. If you've ever sprained, bruised or cracked your ribs, then you know it hurts like what you imagine Hell hurts like. Particularly, it hurts to breath. So how you ride a gruelling bike race in that condition is unknown to me. I like that he writes this post and still can recommend a book. It's got a great punch line so I won't spoil it but just say you should go and read it now. This does bring up another troubling question. If these cyclists are so tough, mentally and physically, why do they fight like a bunch of big girl's blouses? I guess when it comes down to it, not many of us fight with the grace or the power of someone like Cassius Clay or Georges Laraque. As for myself, I'm a lover not a fighter. Tonight I went to see a animated short program compilation from the Best of the Ottawa International Film Festival. It's been about ten years since I've attended one so I was looking forward to seeing the show. I can't say I was blown away. I can't even say I was awake. Most of the selections were idiosyncratic "experiments". I use quotes because typically, an experimental film offers innovation in some way, either in storytelling, or technique or even just stylistically. Yet most of these were using traditional techniques and weren't really that compelling on any other front. From the fray, two or three films were head and shoulders above the rest. Easily the most entertaining film was "The Terrible Thing of Alpha-9!" Another noteworthy piece was "Please Say Something" which, in an almost naive computer style, depicts the possible dissolution of a relationship. The only other bright spot, was a student short called "The Art of Drowning". 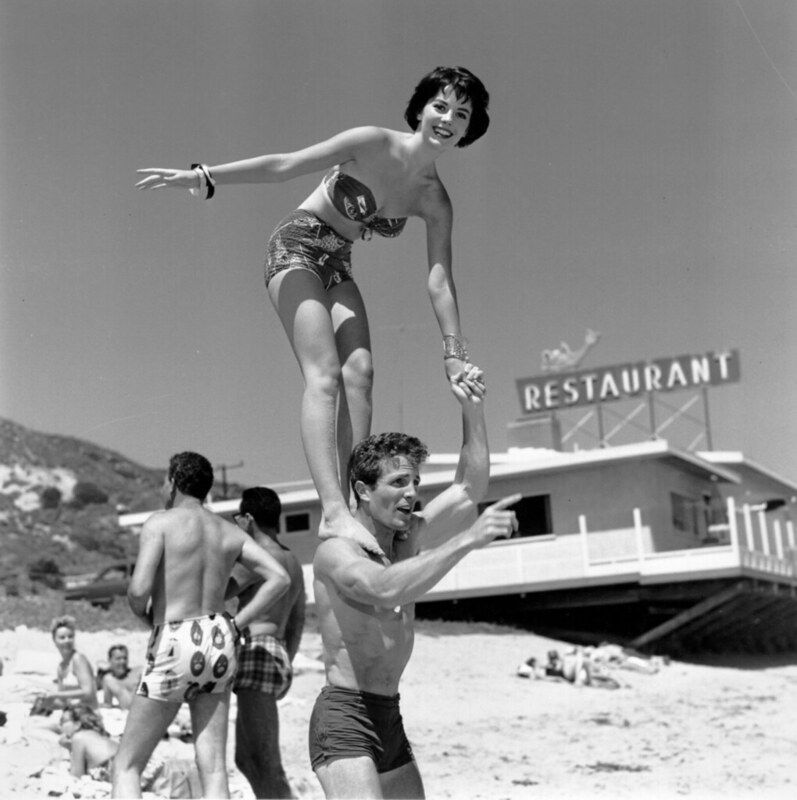 Marv Newland's short was a better idea than a film (which is pretty much his wheel house). My favourite was a sort of wonderful travelogue, "Madagascar, A Journey Diary (Madagascar, carnet de voyage)". Below is a wonderful clip which doesn't really do it justice of an oddly ebullient funeral scene in a small village. The film has a fantastic subtlety of colour and movement and seems to blend hand drawn images with computer compositing really seamlessly. The rest of the program was like I said, dreck. It was a complete letdown to know that ten years on and the OIAF doesn't seem to have progressed much. Or at least that's what this would suggest. Independent animation used to be the place to see what was cutting edge and different. Based on this, "different" and "edgy" look pretty hollow and undeveloped. Maybe it's just the success of feature length and series animation that the best and brightest are working on mainstream productions rather than independently. Regardless of the reason, missing the Ottawa Animation Festival doesn't really feel like missing anything. With the help of Pentagram's design ability and GE's undoubtedly massive health data, you can quickly see your worst fears subside (or worsen) depending on a few simple metrics such as gender, age, height and whether or not you smoke. 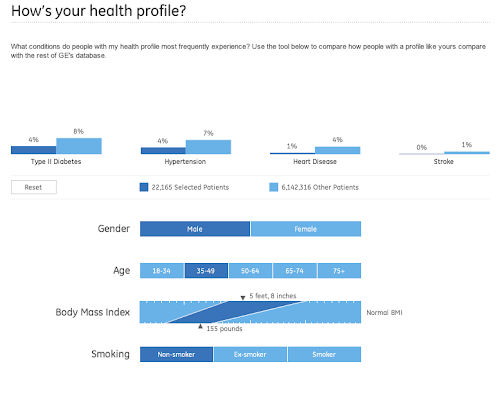 GE's Health Visualizer takes only seconds to predict your statistical likelihood of developing diabetes, heart disease, hypertension or stroke. Of course, I assume this is based on American stats, not that Canadian statistics differ that much. Yet, you'd have to think there'd be some statistical discrepancies if you lived in Northern Europe or Asia. A recent study has concluded that these types of stats could be more telling if waist size were combined with Body Mass Index (as you could weigh a lot and be very fit or weigh a lot and not be fit at all). Also, where your fat accumulates is indicative of particular diseases. Another thing missing from this would be some sort of family history check list. I'm always on the fence about statistical feedback mechanisms like this, especially when you find out how complex analysis of data can be and what different results you can arrive at with the same numbers. Still, if you aren't overweight and don't smoke, try this out, you'll feel better about your chances in no time. 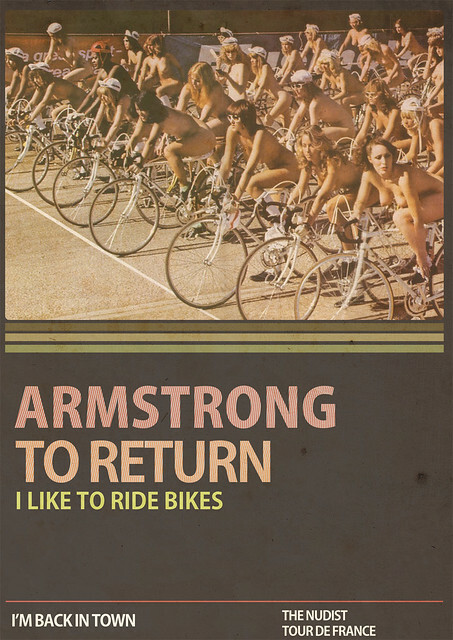 The return of Armstrong - fake cover (repost), originally uploaded by Rétrofuturs (Hulk4598) / Stéphane Massa-Bidal. Now that I've finally calmed down from this morning's ride / tirade, I can go back to obsessively following the Tour de France. In fact, it's some relief that the World Cup has ended as my attention to work was beginning to strain. It certainly complicates any problem of focus you might have that these events all take place during the work day. Whether you stream video to your phone or through a Web browser, or follow the HTC-Columbia's live data stream on Google Maps, your attention is stretched to the limits of human neurophysiology. How would people normally follow these events without the Internet? Traditionally, I mean. Would you actually take days off and watch it on television or listen on radio? Who are all those people who line the route or attend matches? Students? The unemployed? It never ceases to amaze me that some folks can be that devoted to a sporting event and yet it doesn't interfere with their normal workaday lives. Or at least, I assume it doesn't. Perhaps they're all divorced alcoholics with emotional issues. Or maybe they're just to simple to bother being concerned. I ride everyday in Toronto. Despite taking slower one-way side streets, it is, undoubtedly, the most stressful part of my day. This morning, on a day when I decided to ride like a boy scout, signalling every turn etc, I was yelled at by an irate driver. While winding my way through a utility-scarred, pot-holed laden street, I was accosted by a driver telling me I was riding erratically (in somewhat less polite terms) and I retorted that as a part of traffic I had every right to ride in the middle of the street to avoid dangerous obstructions (in somewhat less polite terms). In the end we decided to agree to disagree (in somewhat less polite terms). The stress of riding in the urban environment might not be as bad every day as it was today, but this aspect of riding a bicycle on the streets of a North American city cannot be taken lightly. Also, it has been my experience that cycling surveys originating in Europe (particularly Denmark) are meaningless to cyclists in North America. Needless to say then that I think Treehugger's Five Benefits of Cycle Commuting over simplifies the act of commuting by bike. My morning ride lasts about ten minutes, and is only about 2.5km long. In that brief ride, I pause at five stop signs, stop at two sets of traffic lights and weave my way through some of the worst road conditions in Canada, save for perhaps a B.C. ice highway in April. In that ten minutes I see drivers turning without signalling, rolling through stop signs and red lights, driving up on the side walk, reversing the wrong way down one-way streets and generally acting as complete and undiluted assholes. Despite this, I will take a deep breath, take the lane that my property tax pays for, pay tickets if issued, and ride to avoid heavy traffic but if cursed out by an aggressive driver, I will curse back. 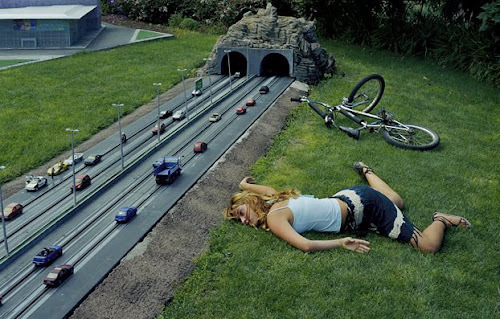 Call it road rage if you want. I don't like it. I'd prefer to avoid it but do not under any circumstances scold me from your half-ton pick-up and not expect an argument. You will receive the full wrath that my tongue provides which I will say, is not inconsiderable. You have been warned. Have a nice day. I just stepped out to grab some lunch and the heat hit me, SMACK, like stink from a barn. Then when I came back I saw this blog post from Scott Hansen and now all I can think about is going for a swim. The A/C is on in the office but once you're used to it, it doesn't feel on at all. That's just how hot it is out there. My swim probably won't even be that refreshing. The first 10 laps will be awesome but after I finish and get out and shower, I find I'm still sweating. Then there's the 15 minute ride home. By the time I get back I'll need another shower. What we save on not using air conditioning, I'm sure I make up for with water and electric fan use. Classic comedy holds up. This Kids in the Hall skit should be required viewing for Canadian film students (perhaps paired with The Lost Weekend). Recently, I've been watching old SCTV shows and, this is hard to say, but they just aren't as funny as I remember them. The same isn't true for The Kids in the Hall. If anything, it's actually a lot funnier and more subversive than I remember. We're currently battling through a devastating heat wave in Southern Ontario (as are the Eastern states) so it might be the right time to switch from beer to ice chips floating in a terrarium-sized glass of fruity flavoured alcohol. Tonight we walked to the local theatre to catch Please Give (2010). 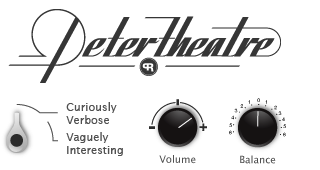 It gives me a lot of pleasure just to say that we "walked" to a "local theatre". It's even better if you like the movie. Amusing, intimate, affecting but also ambivalent, Please Give is a story of a New York couple who buy furniture of the recently deceased to resell for considerable profit in their fashionable mid-century Modern furniture shop. Are we too wrapped up in our lives to see what matters? Do we worry too much about the sadness in the world to enjoy our lives? Who's to say, but those are some of the questions you're confronted with in this film. Given the heat in T.O. this weekend it's always nice to seek some public A/C in a movie house. Judging from the forecast we might see a lot of movies this week. opportunity, and coming to terms with regret. this film from dud dialogue and very weak supporting players. Martin Short, Lily Tomlin, Campbell Scott, and of course, Glenn Close. misdirection of the directing and editing. autistic animal behaviorist and abbatoire designer, Temple Grandin. moments as it focuses on Grandin's education and early breakthroughs. alone is worth the price of admission. the über-competent but complicated, pain pill popping Nurse Jackie. balance of comedy and drama keeps the tension brewing.